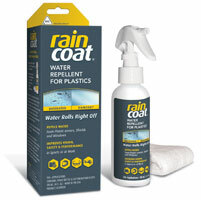 Raincoat Water-Repellent Coating, made specifically for plastic to fix fogging problems, is available as a paste and spray. The wax blend gets 90 percent of water off plastic lenses and windshields without harming the plastic. With this coating, injuries and fines can be avoided.